The first Earth Day, on April 22, 1970, highlighted a new commitment to environmental protection. Significantly, this year also saw the establishment of the U.S. Environmental Protection Agency (EPA). The EPA was formed in an effort to consolidate the environmental regulatory activities of the federal government under the jurisdiction of one agency. The mission of the EPA is to protect the air, land, and water of the United States. Prior to the creation of the EPA, environmental regulatory activities were divided among many agencies and focused on specific segments of the environment that are affected by various pollutants . With a growing awareness of the interrelations existing in the environment , the focus of regulation shifted to the pollutants and their effects on the air, land, and water as a whole. The EPA was formed in response to this new approach to environmental regulation. The EPA is responsible for the administration of a number of comprehensive environmental protection laws. It conducts standard-setting and enforcement activities for these laws. It monitors the activities of industry and other federal agencies with respect to their effect on the environment. The agency conducts its own research and supports the research of other public and private groups. EPA works to coordinate national regulatory activities with those of state and local government agencies. It also supports educational activities, strives to make information more readily available to the public, and promotes public involvement in the formation and implementation of new policy. The Clean Water Act, the Safe Drinking Water Act, and the Marine Protection, Research, and Sanctuaries Act are major laws related to water that the EPA administers. Many other laws not specifically related to water also fall under the realm of water policy because of the effects of the activities and pollutants they address on water resources. 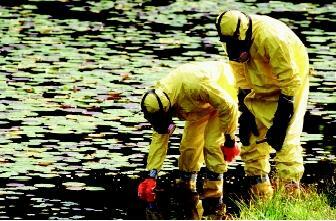 Environmental scientists may sample lakes, rivers, wetlands, estuaries, or aquifers that have become contaminated. Protective suits and respirators are required when scientists may be exposed to hazardous materials. The broad scope of the EPA's mission allows it to address concerns related to water comprehensively. The EPA's Office of Water is the primary arm of the agency that addresses water policy issues. This is where the Water Policy Staff and other water-related divisions are housed. This office has a number of responsibilities for laws affecting water. The Clean Water Act of 1977 is perhaps the best known of these laws. It sets the basic structure for regulating discharges into U.S. waters. The EPA sets standards for discharges and delegates many permitting, administrative, and enforcement responsibilities to state governments while retaining oversight of state programs and activities. The EPA is the primary federal agency setting standards and enforcing environmental laws. While many responsibilities have been delegated to states, the EPA is ultimately responsible for the oversight and coordination of efforts to restore and protect water resources. Recent policies have focused on a watershed-based approach, and efforts have been made to set goals and provide local groups with the tools and resources necessary to meet these goals. With these efforts, the EPA is continuing to carry out its mission of protecting the nation's air, land, and water by coordinating the development of new policies and the administration of existing policy. SEE ALSO Clean Water Act ; Legislation, Federal Water ; Safe Drinking Water Act . Kline, Benjamin. First along the River: A Brief History of the U.S. Environmental Movement. San Francisco, CA: Acada Books, 1997. U.S. Environmental Protection Agency, History Office. <http://www.epa.gov/history> . U.S. Environmental Protection Agency, Office of Water. <http://www.epa.gov/ow> . WHAT IS YOUR HYDROLOGIC ADDRESS? Watersheds are areas of land that catch precipitation and drain into streams, rivers, lakes, and marshes, or seep into groundwater. Delineation of the land into watersheds allows for a comprehensive approach to addressing concerns by allowing for consideration of all potential sources of pollution that may contribute to the quality of a receiving water body. The U.S. Geological Survey developed a system that identifies water-sheds based on Hydrologic Unit Codes. This code identifies any hydrologic area by region, subregion, basin, and subbasin. Anyone can determine what watershed they are in by visiting the U.S. Environmental Protection Agency website, <http://www.epa.gov/surf3/watershed.html> .